The Colts at Broncos special teams preview looks at the kickoff and punt coverage units, the return teams, plus the kickers and the punters for both teams. The Indianapolis Colts travel to Denver to battle the Broncos in what shapes up as a high-scoring affair. While the AFC West winners have been near the top of the conference all season, they begin their playoff quest with question marks after a lackluster finish along with some uncertainty on special teams. The Colts bring two of the best specialists in the league to the Mile High City in Pat McAfee and Adam Vinatieri. However, their punt coverage and punt return units both have issues that could show up in this game, making it an intriguing matchup of two flawed-but-talented teams. McAfee rated as one of the league’s best punters in 2014, with a booming 46.1-yard gross average and all the peripherals to back it up. He saw 43.5% of his punts land inside the 20-yard line, with only 4.3% going for touchbacks. He had no kicks blocked and consistently ran snap-to-kick times of 1.9 seconds. So what did McAfee do in the first round of the NFL Playoffs? He promptly launched two of his four kicks for touchbacks with zero kicks inside the 20-yard line. Oops. While on the surface this appears a terrible performance, the stats become more forgiving after some digging. One of McAfee’s touchbacks, a 68-yard bomb, still ended up creating a net field position change of 48 yards. Another, from the opposing 40-yard line, came a situation that probably called for a Vinatieri field goal attempt. The 57-yard distance likely fell within range for Vinatieri, who had previously split the uprights from 53 with plenty of room to spare. This disclaimer, while not letting McAfee off the hook completely, provides situational context. These are the types of kicks McAfee must hit on a regular basis against the Broncos. He has proven he possesses the skill and consistency required of an elite punter, and McAfee needs plenty of both this weekend in Denver. The thin air should be a boon to distance, but likely reduce the control McAfee has on his punts. The Broncos are not particularly strong returning punts, ranking 20th in the NFL with a 7.2-yard average this season, with a long return of only 22 yards. 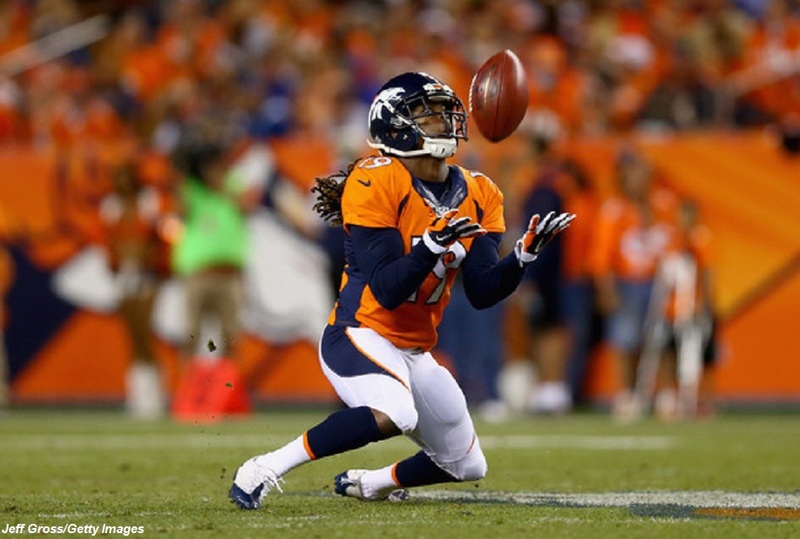 Isaiah Burse is the primary returner for the Broncos, but the issues stem more from inconsistent execution in blocking. 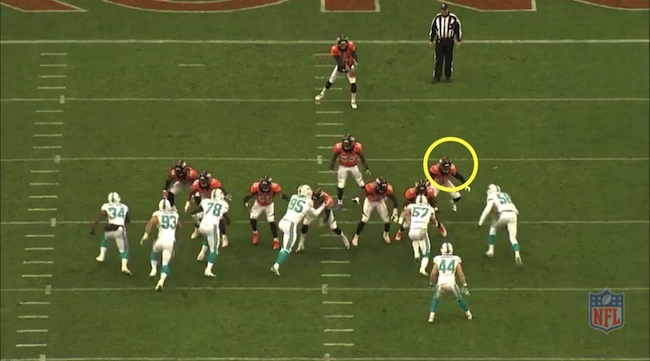 Circled in yellow are two Bronco blockers, both within three yards of multiple Dolphins. 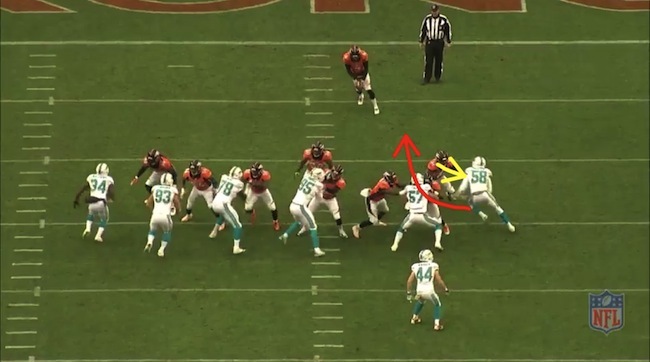 They ignore the three Miami defenders in between them, allowing them to get downfield and stop the return for minimal gain. 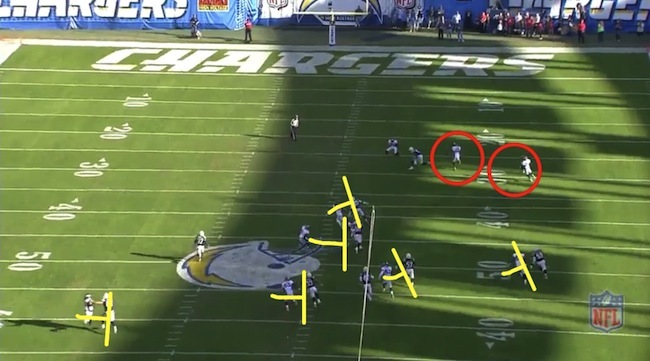 Six Denver blockers are in position to seal off San Diego defenders to the right side of the frame (indicated in yellow), allowing the returner to bounce the kick to the opposite side. However, the two Broncos (circled in red) blocking the right gunner failed to complete their assignments. The Charger defender slips past them and, despite the great work by the rest of the team, he now has position to disrupt the return. This type of execution is unacceptable in the playoffs, and Denver needs to have it cleaned up against the strong-legged McAfee. Britton Colquitt handles punting duties for the Broncos and, despite the thin air of Sports Authority Field, has done little to show he is anything more than mediocre. His punts travel an average of 44.2 yards, a full yard below the NFL mean, and his peripheral stats rate only slightly better. Colquitt lands 36.2% of his punts inside the 20-yard line, just over the NFL average of 34.6%, and has 27.5% of his punts fair caught compared to 27.3% for the rest of the league. Colquitt is quick and technically sound, regularly getting his kicks off between 1.8 and 1.9 seconds. However, the Denver punt squad is among the worst in the league, with inconsistencies that should not exist on a playoff team. The Broncos allowed 11.2 yards per return, 4th-worst in the league. Although an 84-yard touchdown skews that figure, pulling it out still leaves them with a 9.3-yard average return ‒ still only half a yard above the average. This is a major problem for Denver, and could be the difference between winning and losing a close playoff game. McCain notices this and swims to the inside, getting past Nelson easily. While Colquitt managed to get the ball away and avoid a blocked kick, he came under significant pressure. 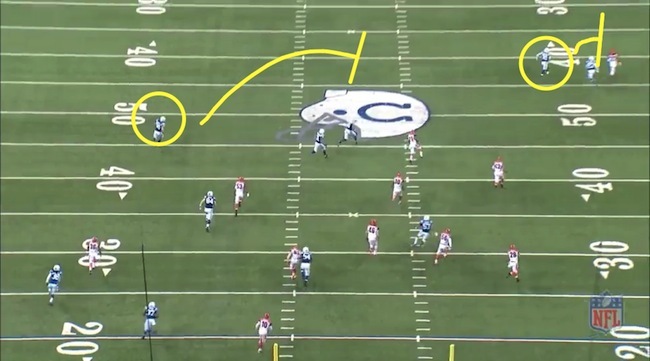 The Colts may be able to exploit this weakness, as Denver has failed to correct these mistakes. Unfortunately for Indianapolis, the Colts display few indications they can attack the Broncos punt unit effectively. They tend to bring little pressure and, as detailed in our Wild Card preview, their return unit is often disorganized, resulting in the 7th-worst return average in the league at only 6.9 yards. They showed slight improvement against the Bengals in the wild card round of the playoffs, but still inspire little confidence in their abilities. 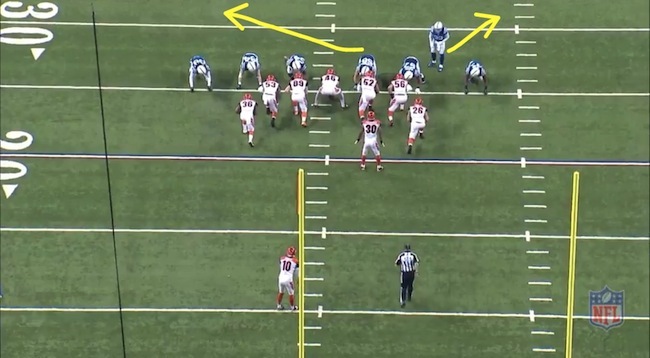 Immediately after receiving the punt, Cribbs takes off towards the left of the frame to take advantage of his blocks. 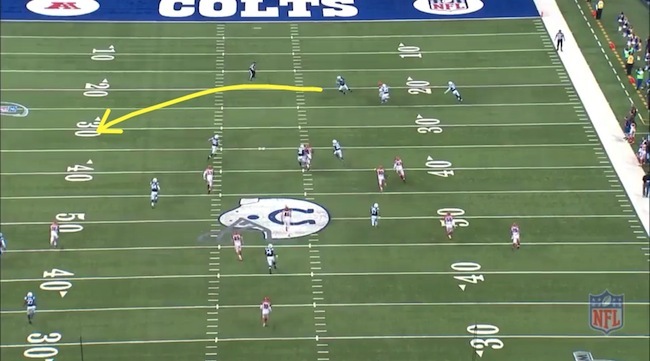 This play resulted in a 15-yard runback, but the Colts averaged a mere 7.0 yards per return in this game despite running this return to both sides on multiple occasions. They are simply not a strong return team, and this should concern in the Broncos over this phase of the game. McAfee kicks off for the Colts, with his 72.9% touchback percentage ranking second in the league in 2014. His performance in the opening round was flawless as well: six kicks, four of them touchbacks, with the other two kicks returned from nine yards deep in the end zone. He rivals Carolina’s Graham Gano and Detroit’s Sam Martin as the best kickoff man in the league, and will pin the Broncos deep in their territory to start nearly every drive. The Indianapolis coverage unit is also above-average, giving up a yard less per return than the NFL mark. McAfee will earn his money this weekend, as Denver has the 8th-best return unit in the league, averaging 25.1 yards per return. Omar Bolden and Andre Caldwell handle return duties for the Broncos, with Bolden the better of the two with a 33.0-yard average on 13 returns. This is a great matchup but, much like great pitching in baseball, great kickoffs tend to beat great returners more often than not. Brandon McManus isn’t far behind McAfee when it comes to leg strength. He boomed 70.3% of kickoffs for touchbacks this year, and the only question remaining is his ability to do this on an annual basis like other top specialists. 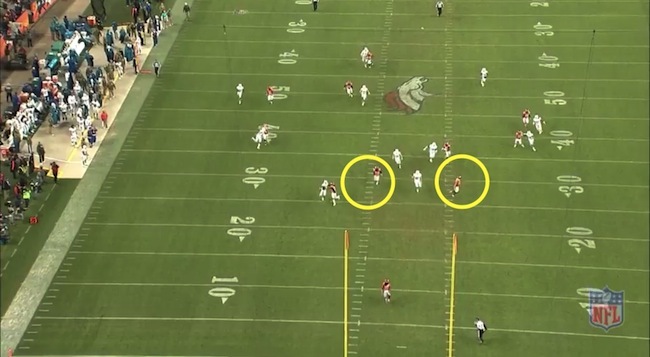 Denver’s thin air helps, but there is little doubt that he has the ability to boom the ball deep in any location. The Broncos are not a strong coverage team, giving up 26.1 yards per return, more than two yards above the league average. McManus is the key for this squad, as he has the skill to go toe-to-toe with McAfee and even out the field position battle. Indianapolis features a strong return unit led by Cribbs, still one of the best in the game on kickoffs with an average of 32 yards per return. 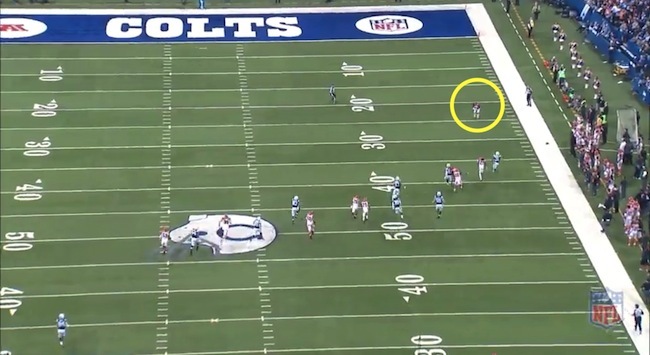 While he no longer has top-end speed to run away from defenders, Cribbs is capable of a big return on any play. Griff Whalen has also returned 15 kicks for the Colts for a 25.3-yard average, which still bests the NFL mark by a yard and a half. This is a dangerous unit, and presents another great matchup. By the time you read this, he’s probably done this again. Broncos kickers have had a tumultuous season. The team released Matt Prater after he served a four-game suspension under the league’s substance abuse policy. Denver decided to stick with McManus as their primary option, but he struggled in extended duty going only 9-for-13, an unacceptable 69.3% mark in today’s NFL. The Broncos then turned to Connor Barth, who rewarded them with 93.8% accuracy including a 5-for-5 performance against San Diego. Barth ranks as an average kicker for his career, as his 85.3% accuracy would have tied for 16th this season. The kickoff and kickoff return units for both teams rank among the best in the league, but several other units leave significant room for improvement. Denver’s weak punt coverage team is mitigated only by the Colts’ inability to return punts. The Broncos have had significant struggles on punt runbacks as well, and are likely to get very little from this phase of the game. Vinatieri and McAfee remain two of the NFL’s best at their positions, and present a treat for fans. Overall, Indianapolis has an advantage in this game due to this quality pair, which they will need in facing an otherwise strong Denver squad.